“Less is more” is becoming all the rage in electronics design. There is more demand than ever for components that consume as little power as possible in the design of automation systems, appliances, medical devices, and similar types of electronics. Small devices aren’t the only ones with low power demands. That’s why Renesas Electronics has introduced the first products in a new family RX200 series of 32-bit microcontrollers. The company says its new RX210 chips allow for the development of high-performance electronics systems without high power consumption. 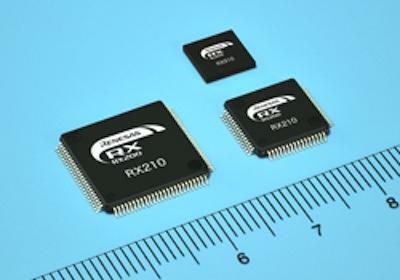 Enhanced with more Flash and RAM memory, the RX210 devices provide more freedom for software development by allowing designers to implement more features while retaining the power of previous Renesas microcontrollers, Haddad said. “For instance, they can embed more language variants of their user interface in a single device, simplifying the design and logistics of their products.” Designers can also implement complex software stacks, like TCP-IP, file systems, and encryption, and they can use the additional memory to embed an RTOS, like Micrium RTOS and Middleware. Cost and regulatory considerations are among the factors driving the industry’s low-power trend. “By lowering the power consumption in active mode, for the same performance, the designer can reduce the current output need of its power supply, thus reducing the cost of the power supply design,” Haddad said. Also, more regulations are being passed to reduce power consumption as part of the effort toward energy efficiency. An integrated rich function set of 7 Uart, 8 SPI, I2C, comparators, 12-bit ADC, 10-bit DAC, and 24-bit ADC (RX21A), which will reduce system cost by integrating most functions.